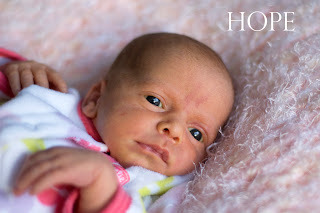 I am working on the birth story... for those of you who keep asking! But somehow it's just not something I'm up to writing right now. That and going through all the pictures... I'll get to it! 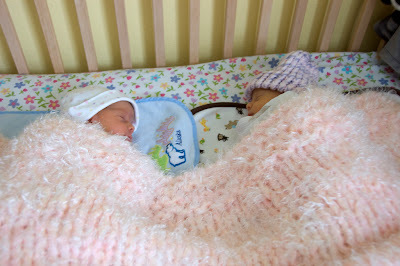 They are sharing a crib for now, and even the same blanket! One time we came in to find the Joy (on the right) had scooted over closer to Hope and Hope had her arm out and was touching her head. Small enough to share the same bouncer for awhile... although I'm not having to fish their arms out of their jammies every time I pick them up now. They're definitely growing, although the jammies are still very large width wise! And most of the time Hope will be in pink and Joy in yellow, purple, brown, etc. We can actually tell them apart and just tonight Brian switched the blankets on me and handed me one to feed... I looked at her and said, no, this is the other one. I checked the (painted) toenails to be sure and I was right. :) Currently it's mostly due to the faint red birthmarks on their foreheads and eyelids, which will fade eventually, but they also have different personalities and Hope's face is rounder than Joy's. So we'll see! They are pretty good babies and eat very efficiently, for which I am thankful! The house is actually rather quiet with just them here and the boys gone for a couple days! 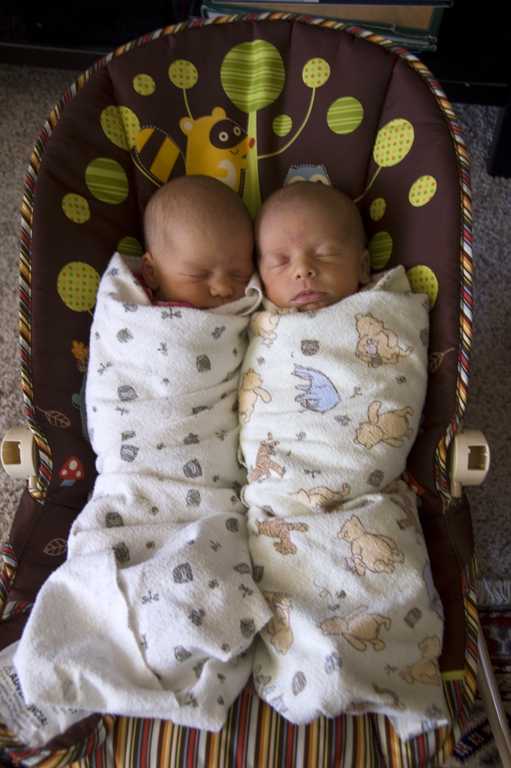 I so love seeing this update - brings back so many memories of our newborn twins. I remember wondering if I'd be able to tell mine apart by voice alone. It took us several months, but, sure enough, we can! Precious pictures. I can't wait to meet my very first nieces! !